If someone has info on were other better photo's or links of the show are please inform me. 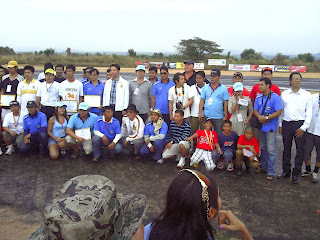 I have a crapy camera and was too involved in the show to capture all the exiting moments, But there must have been 30 or more pro photographers out here that I'm sure got some really cool shots I saw one with the name “rc action” at the show on a mike that I will look for later. For me the last event was getting to try my S3 wing with it's added LED light strips as it got dark. I didn't bring the lights yestarday and was sorry as they must of had 10 or more planes in the air at the same time lighting up the sky like fire flies yestarday with a free for all. Today we only had about 4 planes with lights and one heli lit up. I won't forget to bring my lights with my plane next year. As I was leaving I saw the stage with the band and beer kegs of beer to continue the party for others, but for me it was a long day and I had to go home. Update: January 26, 2013 9:14pm Today was another day of excitement and carnage. The biggest crash of the day came last with Fabien's attempt to fly his orange jet at night in the dark with some glow sticks attached at points on the wing and body to light it to orient the pilot of it's present orientation in flight. I think I heard the original value of the jet aircraft was about 350,000 bhat or more. The take off looked good but when I watched it do it's first 180 degree turn I noted I could see the green glow sticks OK but the red sticks seemed too dim for me to make out a good orientation. On his second 180 turn attempt back to the field I completely lost site of the aircraft. I waited thinking it would reappear but it never did. I didn't hear any noise from the crash other than voices of people who were watching it started to make more comments. It was then that we knew that the jet had gone down. I started to move in the direction of the crash and when I got there I saw a few people carrying some parts of the plane back to the flight line. I saw Fabien returning in front of the group carrying the nose of the plane as they carried it back. When they got back to ground station I had a chance to ask Fabien what he thought caused the problem. He told me that he misjudged the velocity. He Thought he had plenty of speed but it seems he didn't. As I think he was trying to fly as slow as possible to track the difficult to see plane. I guess he ended up flying to stall speed with not enuf speed to keep control and not enuf altitude to recover and not enuf light to judge conditions or any other alternatives. But as he now still has 3 more jet's in his inventory of toys. I'm sure he will not loose too much sleep over it. Also it looks like the wings didn't get damaged. Only the nose looks to have taken most the impact. From what I see I think the engine and most the electronics will be salvaged. The landing gear I'm sure will need to be replaced and some of the electronics in the nose like batteries might have been lost. I think there is a 95% chance the jet could fly again. 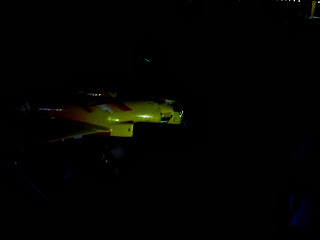 I got one picture of the crashed jet but at night my camera with no flash takes bad pictures. But this is what I got: There were many other crashes mostly helicopters that seemed at one point were crashing at a rate of 1 out of every 2 flights. When they didn't crash they flew incredibly, doing almost impossible stunts the likes of witch I have never seen. As far as me, I'm happy I got the electric motor I was looking for. I got a 2814 1000kv mistery motor for 750 Baht That I hope will complement my M2 wing that is in need of a motor to get it back into the air. I got the motor from the tent that represented this shop http://twinprohobby.com/. It looks like they have all the cool stuff I like. I'll have to check them out when I go to bangkok or see if they can ship local. I also took some other pictures before it got dark that I will later put onto my picasa gallery for all to see. Here's just one shot that was taken later in the afternoon when things were slowing down: The start of the Pattaya International RC Air Show 2013 began today Jan 25th 2013 with a bang. 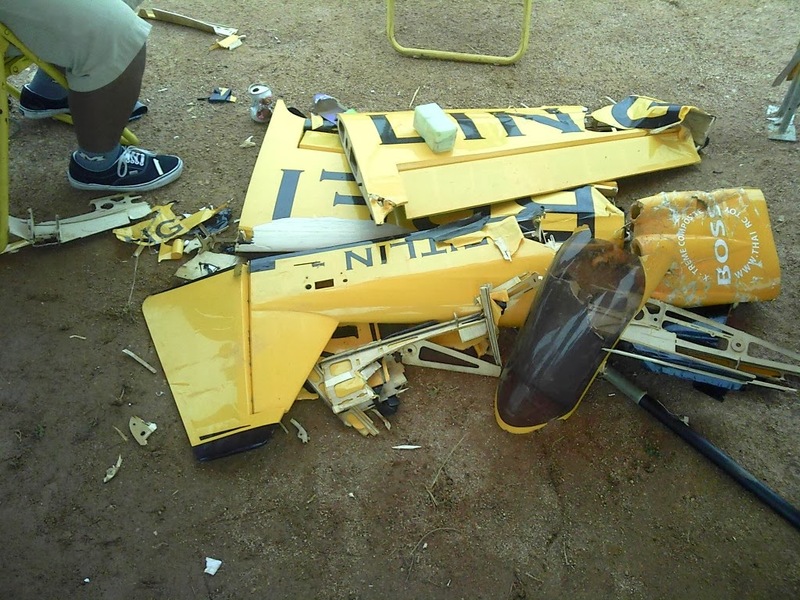 The first crash was a big yellow 3D aircraft must have been about 1.5 meter wing span. I only saw what was left after the crash that required at least 4 people to collect and carry what was left of it. The larger of the parts looked more like a large number of tooth picks held together with tape as it must have been a built up balsa air frame that normally don't handle impacts well. I will post some pictures of it when I find some. It seems I do have a picture of it before it crashed seen here: and another close shot of it. I'm not sure this is the plane but if not it sure did look a lot like this one. I was able to get a shot of the remains of the crash later as seen here: I heard later there was another aircraft crash by the same pilot but I didn't see any part of that. I was involved with checking out an FPV auto pilot demonstration when the crashes happened. There were some rumors that the FPV's 1 watt 2.4ghz video transmitter might have been part of the cause but I don't think so. The two aircraft weren't in very close proximity. Even if the transmitter was within 10 meters or less distance it is very unlikely it would have any effect. Another rumor was that the receivers might have got wet from the rain we ended up having later in the afternoon sometime before the crash events. 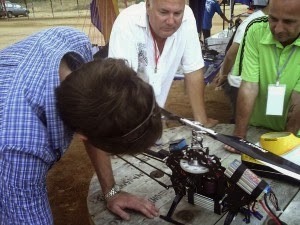 The FPV Thailand group was present and provided a demonstration for us. I didn't get the guys name that was showing me many of the details of the aircraft and he didn't have a biz card to provide me with any other details other than he said I could find more details on rcthai.com. when I searched google I found this about his group. http://www.rcthai.net/webboard/viewtopic.php?f=251&t=484379 The FPV aircraft he showed us had some cool new things I've never seen in action before with an auto tracking patch antenna system, that would move to point the antenna to follow the aircraft as it flew from telemetry gps data sent down to the ground station from the aircraft. It also had a cool feature I've never seen with him able to change the OSD overlay video content of the screen controlled from the flysky r/c remote control. 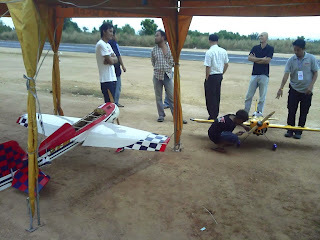 I did get some photo's of at least one of his FPV aircrafts as seen here: but I failed to get some pics of the video as it was in flight or the ground station and tracker system. He told us his video range was out to about 5km with his present system of 1 watt 2.4ghz video with the tracker, he was also running a 433mhz dragon r/c remote module on a flysky r/c radio. From the OSD display during flight I could see he was flying around 400 meters high at about 35kmh on average with his custom home made plane. There wasn't a lot of flying today yet with only a hand full of pilots. They mostly were just setting up to prepare for the weekend for the main event. I will be present on each of the three shows and will update this article with all three days major high lights. Oh and remind me to take more pictures on Saturday and Sunday if and when you see me. I get so into all the stuff myself that I fail to think about taking some of the best pictures that I should have. I personally only got 2 flights with my S3 wing. 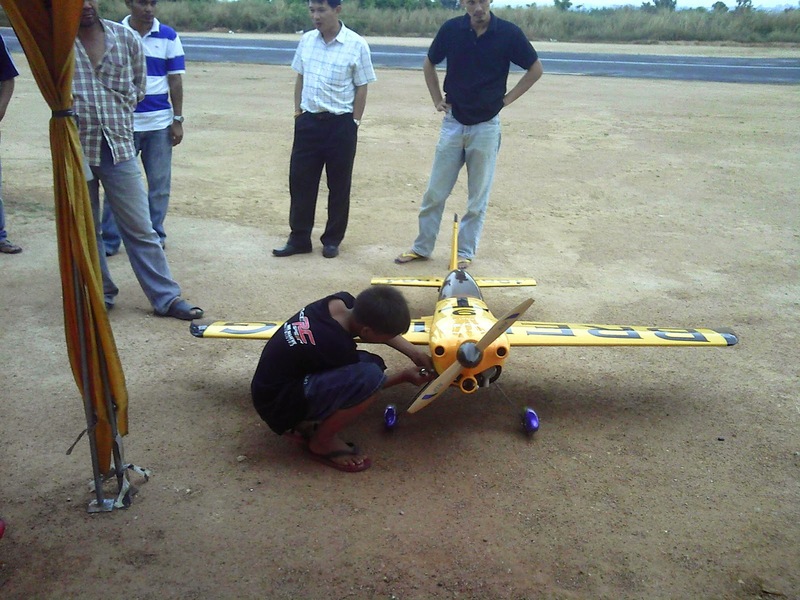 It had some problems not being able to get it to trim from the radio on my first flight. I had to make some mechanical changes to get it trimmed on my 2nd and last flight of the day for me. Only other picture I got worth posting was this helicopter shot that looked cool. 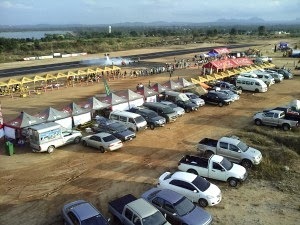 I know nothing about heli's so can't tell you much more than what you see: There were already some tents setup selling heli's and parts and I'm sure there will be many more setup on Satarday and Sunday with even more heli goodies. Oh and the other cool thing is the runway it totally repaved and smooth thanks to Pattaya City.